JJ Abrams promises Episode IX will honour The Last Jedi, but also add to it. Star Wars: The Rise of Skywalker won't retcon The Last Jedi when it comes to Rey's parents, but director J.J. Abrams has promised that there'll be some additions to what we were told in Episode VIII. Rey's parentage has been one of the hot topics of Disney's Sequel Trilogy, with rampant speculation both before and after The Force Awakens. Was she a Skywalker? A Kenobi? A Palpatine? Something else? Rian Johnson cut down all of these theories with The Last Jedi, where it was revealed that Rey's parents are actually nobodies. "I will say that we knew, going into this, that this movie, it had to be a satisfying conclusion. And we were well aware that that’s one of the things that’s been out there. I don’t want to say that what happens in Episode 8 [didn’t happen]. We have honored that. But I will say that there’s more to the story than you’ve seen." It's a very typical Abrams sort of tease, which could be interpreted to mean a bunch of different things. But the baseline seems to be that while Rey's parents are nobody we know, The Rise of Skywalker will further explore either who they were, or some other aspect of her creation, and build upon what we learned there. Given the divided fandom, that might be the best way of opposing both sides when it comes to Rey's parents. 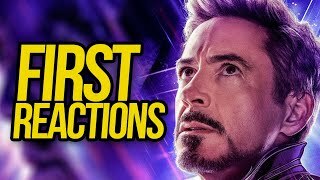 Avengers: Endgame - 15 Biggest Rumours From 4Chan & Reddit Supposed "Leaks"
NCTJ-qualified journalist. Most definitely not a racing driver. Drink too much tea; eat too much peanut butter; watch too much TV. Sadly only the latter paying off so far. A mix of wise-old man in a young man's body with a child-like wonder about him and a great otherworldly sensibility.